The Chicago Cubs, Kris Bryant, Red Bull and I teamed up to created a hand painted pair of cleats for Bryant to wear during a live Players Weekend game, August 2018. After the game, the cleats were put up for auction of Kris Bryants Charity of choice (Wings For Life). The Chicago Bears asked me to create a mural to help promote the upcoming football season by creating a mural that would inspire public engagement and interaction. The Chicago Bulls and the United Center invited to me to create a custom ASTA/BULLS hat for a game night give away to over 10K fans! The United Center and Dark Matter coffee invited me to create 4 original paintings to be shown at the Mad West Kiosk (Dark Matter Coffee) located inside the United Center Atrium. These four paintings are up for raffle… all proceeds go towards Hope For The Day (Charity of my choice). The Chicago White Sox invited me to create a mural that will be placed in the tunnel on opening day (April, 4th) for the players to take photos in front of. The mural will then be moved to live permanently in the Tap Room at the Guaranteed Rate Field. The Chicago Fire invited me to create a custom hand painted guitar that I will present to Heineken’s Man Of The Match on 3/30/19. 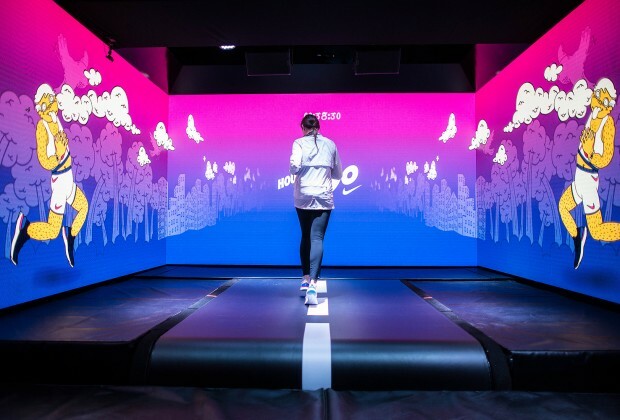 Nike invited me to create drawings and animations used for an interactive popup event showcasing the release of a new shoe!You could run on the giant treadmill while my characters ran with you and mimicked your move! Adidas invited me to create wrapping paper for their Chicago based store!. Customers making purchases two weeks before Christmas could have free in store gift wrap available with my art! Italia!! Asta Art Tour is currently in Tuscany! This is my second International job and WHAT A PLACE TO BE. I am living and painting at a Villa in the Tuscan hills. Just incredible. The owner of this Villa saw my work on social media, reached out to me to see if I would be interested in painting his Villa, emails were exchanged, plans were made, and now here I am! This mural is in one of the 6 bedrooms at the villa and I am so happy with the results! Was truly inspired while working on this mural with the incredible views outside. Breathtaking! This mural is located on Wilson Ave between George and Melrose. This is my second mural in Bushwick! I used to live in the neighborhood for YEARS... but I lived there before the Asta Art Tour was a glimmer in my eye. I was so pleased to hear from and be commissioned by an old friend and acquaintance from my Brooklyn days... I was asked to do a medium sized public exterior mural on a very busy street on a wall that was all graffitied up and tagged... The wall is part of a garage and I was able to bring life to a very sad wall. A homie of mine, Adam Fu, worked by my side on the garage roll up gate. Together we created a pretty eye catching dual mural project! I am always happy to go back to my old stomping grounds *(especially if it's for work!). Always happy to work with Vans. One of my favorite clients! This was my 5th job with Vans. I was stoked when they asked me to do a live mural painting at the House of Vans in the West Loop neighborhood in Chicago. There was live music and live skating and me painting live on stage! Super fun and look forward to the next gig! SIP OF HOPE ☕️⚓️ This is no ordinary coffee shop. Starting May 3, 2018, founders of Hope For The Day will open their doors to the worlds first coffee shop where 💯% of the profits will go towards mental health and suicide awareness. Everyone is welcome here. A safe place. An informative place. A tasty place. A “the world needs more of this kind of place” place. I’m honored to be a part of this campaign and thankful to call Jonny Boucher a close homie for life. This community business is located in Logan Square, Chicago... 3039 West Fullerton Avenue. Whoa! Still beaming and gleaming from this job. Nike asked me to create a one of a kind, unique, interactive art installation for their House of Go pop up shop onMichigan Ave in Chicago. Nike was releasing a new shoe called the Nike React. Lightweight and soft and feels like you're running on clouds and pillows! The idea was to create a large scale treadmill room where you could try on the shoe to test it out and run in a world (created by me) that is bright and vibrant and interactive! When you visited the House of Go, the public/consumers were given the opportunity to try the shoe on, run on the treadmill and run with my characters! You could pick from 1 of 5 avatars I created and while you would tun... they would run. If you raised your arms, they would raise their arms. If you jumped, they would jump!. Such a rad experience for the public but especially for me to see my characters come to life! This was the first time I saw my world animated and it was so incredible. Big shout of to the entire Nike team that work with me to make this dream come true and to Chicago Truborn for the unparalleled support and management. I have said it before, I will say it again! I love doing residential murals. It is such an honor to have my art in peoples homes in any capacity, but if it is a large scale mural in a main part of the house... I am beyond humbled and gracious! This mural resides the South Loop of Chicago for a wonderful retired gentleman that has collected art for years and years. In 2016, he saw my first mural in the West Loop and immediately fell in love. He contacted me and mentioned he was moving in the next year or so and that he wanted a mural in his home. It has been a treat to create a creative friendship with this amazing art collector and I am so happy with the results. His idea for the mural was a loose "timeline" of his life... which we talked about and I was able to translate it into my unique style with my characters. First Chicago gig of 2018 was at a rad marketing business in the downtown Loop! I was commissioned to do this interior mural in the community office space of Liquidus Marketing. The company has specific shades of blue that are present in their logo and company details. I was asked to incorporate some blue into the mural and the result was quite nice! Splashes of blue help carry the eye around the room and makes a nice backdrop for a community space. Was pleased with the mural and was so happy to have left my mark for Liquidus and it's talented team! Early in 2017, I did an interior mural at the Blick Art Materials location in the Chicago Loop neighborhood. Thankfully, the Blick team loved what I did because I was invited to create a large scale mural for their new Berkeley California location. This made me so happy on many levels! It was important to me because I grew up only a few miles away from the new location and I loved that it was my first project of 2018. This project took me nine days and people really seem to dig the bright colors... could definitely be a theme of 2018! Back in 2016, I was invited to create a mural for Havas Worldwide in the common work space of their large scale office. Towards the end of 2017, the knew they were going to demo their lobby and that they had an opportunity to invite an artist in to completely "GO WILD" knowing that it would only be up for a month or so. I immediately jumped at the opportunity as soon as I heard "GO WILD." This project took 8 days and was documented/edited into a short video posted below. The story I tell in the short video is one of my favorite public art, real life, stories that actually happened... I think of it almost everyday. It helped me realize why I make art and what inspires me. News flash! There is a new hoagie in town! Taylor Gourmet, (a "hoagie and more" restaurant), started in Washington DC and has currently expanded out to many cities including the Chicago Loop neighborhood. Cross streets are Dearborn and Madison. Go check it out! Have Hope! Hope for the day! 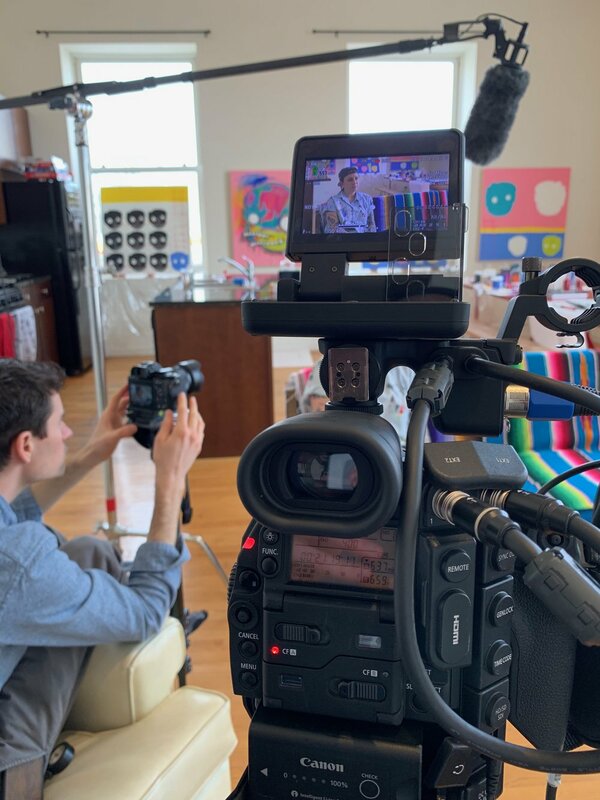 What an incredible charity and organization bringing attention to the fact that "It is ok to not be ok." Starting the conversation about mental health awareness and suicide prevention is incredibly important to the founder of Hope for the Day, Jonny Boucher. I am fortunate enough to be one of a the few artists representing work shown for and at Sip of Hope, the worlds first coffee shop donating all proceeds to the cause. I did live painting for a fundraiser hosted in November 2017. The coffee shop is due to open April 2018 in Logan Square. September of 2016 I was asked to speak at the Cusp Conference (think TED talk) at the MCA Chicago. It was a huge honor to be a part of this event. I was approached by the organizers and founders while I was working on the Morgan/Lake St. mural in the West Loop in Chicago early Spring 2016. They were impressed and inspired by my motivation and inspiration to take my show on the road and tour as many cities as I can making public art/street art. The goal of this talk (in front of 300 people!) was to talk about: what gets me out of bed in morning, why I do what I do, how I got to where I am today, what drives me and how is what I do making a positive/creative impact in the world. I hope you enjoy this talk... I am very proud of it and hope it inspires you to overcome your fears of "taking the plunge" to find your happiness and success. After completing the mural I did for the Emporium Fulton Market location in Chicago, I was commissioned to create a mural for their new SF location November 2017. I only had 2.5 days to create this mural that is located in the entry way to the arcade/bar/music venue. This mural is open to the public and is located in the NOPA district in SF. I think this mural job was the fastest I have ever painted! I had a tight deadline but was able to finish just in time. Emporium SF open this month. I am so happy and proud to have done two murals in the Bay Area in less than two weeks! November 2017 I was commissioned to create at a large mural for the new Oakland Beer Baron location. Beer Baron is due to open at the end of the year! This 800 sq. ft. mural took me 4 days and was such an important mural this year! I grew up just a few miles from this location and it was my first mural in Oakland. It was so wonderful to be back in the Bay Area creating art and I certainly hope not the last. October 2017 I was commissioned to create a mural at a the new Chicago location for the Emporium arcade, bar and venue location in the Fulton Market neighborhood of Chicago. I was given the opportunity to try out some color skills in this rad hallway leading to the restrooms and photo booth area. The idea was to create a black light trippy world and I think I nailed it! People are having a blast taking photos in front of it! October 2017 I was commissioned to create a mural for the creative ad agency firm VML. VML is located in the the River North Neighborhood of Chicago. One of the lead VML creatives saw my work in the West Loop at the West Loop fest and invited me to create a mural in their inspiring space. Numerous local Chicago public artists have graced the walls here and I am honored to have been included!